As a first round CYBILS judge in the poetry category, I've been reading lots and lots of poetry recently. For the past several years, this category has included novels in verse, and this year I think that genre comprised almost half the nominees. There was lots of really rich discussion around these books-- what comprises a novel in verse, should novels in verse be judged with anthologies, etc. The discussions are one of my favorite parts of being a judge-- such smart people. To be perfectly honest, MARY'S MONSTER hung around on my TBR list for a while. I just was not that excited about reading a novel in verse about the creator of Frankenstein. I don't think I ever read the book, or even watched the movie of Frankenstein. Just not something that interested me. BUT boy, oh boy, was I wrong! MARY'S MONSTER IS THE LIFE OF FRANKENSTEIN. Three hundred pages. 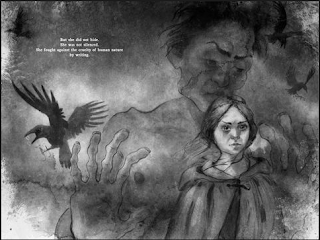 And every single two-page spread includes a beautiful black and white watercolor painting. enough to haunt their dreams. and swallow punishment and pain. because she loved a married man. Her father banished her from his home. But she did not hide. and tell you her own. A HARD BUT BEAUTIFUL EXISTENCE. I am no longer anonymous! but I have a small circle of friends. I edit Shelley's unpublished poems. I survive. I keep writing. but he believed in me. He inspired me to create. And that gave me strength. I have made terrible mistakes. were swallowed by darkness because of my actions. I have witnessed the wreckage of cruelty. I have released those monsters onto the page. • An Author's note- Lita Judge talks about her process, how she structured the novel, what she chose to include, etc. I wish more novels in verse included this. I think it would help people appreciate them as poetry. This is definitely worth reading. The content is pretty mature, but if I was a high school teacher, I'd be buying it for my classroom library! Sylvia Vardell is hosting the year's first Poetry Friday Roundup. Hop over there to see what books next year's CYBILS judges might be reading. Thank you, Carol for your service to CYBILS, and for highlighting this title! Last summer I read a book called ROMANTIC OUTLAWS, about Mary Shelley and her mother, both of whom were writers, championed women's rights, and had their loves and monsters both. So I'd already been exposed to the material in MARY's MONSTER. I think what makes the book so accessible and lovely is the art. Beautiful! What an enormous task you had as a Cybil's judge! Glad you enjoyed Mary's Monster. She's such an interesting, complex person. Thanks for helping with the judging, Carol - and for spotlighting this incredible book. I think we were all amazed by it. Wow...what an amazing book this sounds to be, Carol. And bravo for stepping up to be a judge! Thanks for the Round One work, Carol. I've now read this, have had it a long time, and also read the recent picture book. It is an amazing story, made as real as Mary Shelley's book, Frankenstein, itself. The Second round is going to be tough! OK, I'm sold. Good job being a judge. I would also love the discussions and reading....I'm scared of how much time it would take! So, I'm very glad for your service to the poetry world. Great review. So excited to be on the second round and reading this book. It looks like a contender. WOW. I'll definitely put this on my TBR list! Thanks for CYBIL-ing! I appreciate the time and effort. Wow it must be such hard work being a CYBIL judge. 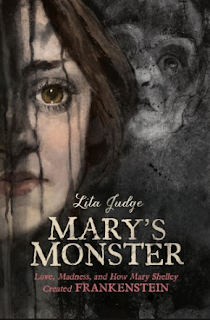 I love your review on Mary's Monster, and will have to put this on my reading list. Thanks for sharing "Mary's Monster" Carol I was fascinated by it when I first saw reviews on the book and am even more so from your review, looking forward to reading it!